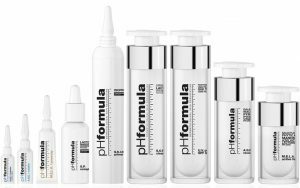 pHformula is the first pharma-cosmeceutical product line which is the result of an innovative alliance between cosmeceutical and medical prescriptions. This dermatological skin resurfacing system focuses on a range of skin disorders, which include premature ageing, sensitive skin, rosacea, acne and hyperpigmented skin. The unique scientific blend of dermatological ingredients offer the most comprehensive preventive and restoring skin care solutions available without a prescription. The pre and post resurfacing products prepare, optimize and maintain the results of the skin resurfacing treatments, making sure that the skin specialist has access to the most advanced treatment system. View the pHformula website here.